Today Amy enjoys reading—children’s picture books, spiritual devotionals, and quirky, fun, fiction—writing, spending time with family and friends, yoga, and…Christmas! 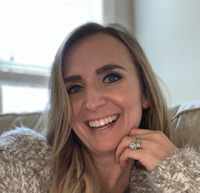 Amy is a passionate Christmas decorator and her Christmas adornments have been featured on the national news, social media sites of major retailers, and numerous blogs. Amy Amy Gelsthorpe is the author of Star Fishing (MacLaren-Cochrane Publishing, Nov. 7, 2017) a children’s picture book about creativity and using the imagination. As a full time children’s book author and stay-at-home mom, Amy was inspired to write by the adventures of her family and her children’s imaginations. Amy has always loved writing, having written and kept her first book of poems from the fifth grade. To ask Amy Gelsthorpe questions, please sign up. "Stop thinking that if you only had the right job, the right man, the right house, the right car, the right whatever that your life will become what you've always dreamed of." I loved this book! The author has a lot of heart that she pours into ever "Stop thinking that if you only had the right job, the right man, the right house, the right car, the right whatever that your life will become what you've always dreamed of." I loved this book! The author has a lot of heart that she pours into every page of this quick but important book. She encourages and inspires her readers—everyone, really—to be the heroes of their own stories. There is so much uplifting, positive energy pouring from these pages that you put it down feeling ready to take life by the reigns and make impactful marks on your world, in every little thing you do. There is no deceit in these pages, she makes it clear that only you have the power to make the necessary changes in your life, and that it is hard work, certainly. It is also clear that these things are achievable and absolutely worth it. Life is messy. It's chaotic, and it's ugly and beautiful all at once, and it's so incredible and worth it. It is yours and it is ready for you. It's down to you and God, but then, it always has been, and at any given moment you have the option of saying you will make the most of the today, tomorrow, and every day after that He gives you to make the things you want to happen, actually happen. You are good enough and all it takes is one moment of insane courage to look the world in the face and decide to accomplish everything you dare to dream. No excuses, and no ifs, ands, or buts. But at the same time, your only limitations are the ones you place on yourself. We’d love your help. Let us know what’s wrong with this preview of Smile by Raina Telgemeier.